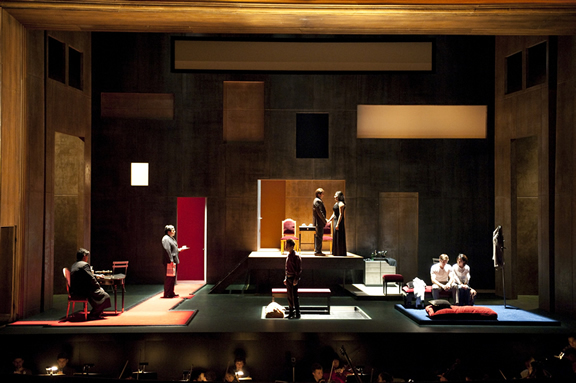 Ariodante was Handel's first opera written to be performed at the new theater in Covent Garden. Having lost most of his soloists to the politically correct, royally supported, Opera of the Nobility, he adeptly managed to lure the the castrato Carestini from the Continent. Carestini was rumored to have complained that some of the arias Handel had written for him did not do justice to his abilities. This, then, is no opera for amateurs, and none were to be found in last night's performance by the singers and orchestra of the Juilliard School. From the opening arioso, sensitively performed by Tharanga Goonetilleke, I knew that although I was in a school, this would be no simple student production. The cast sang and performed with great maturity and self-confidence. There may have been first night jitters, but none that I could see. Done in modern dress with a simple setting, there was no attempt to show that Handel somehow needed to be updated or made relevant to be enjoyed. I shuddered for a moment when Ariodante, admirably sung and acted by Cecielia Hall, grabbed what I thought was a cell phone from her (his?) pocket, only to be relieved when I realized that it was really an engagement-ring box. The plot itself is indistinguishable, for me at least, from a half dozen or so other Handel operas that come to mind. Lovers declare their fidelity which in some way is questioned or tested by an incident involving a disguised character. Confusion and/or despair ensue. The truth is finally revealed and the characters are happily reunited. 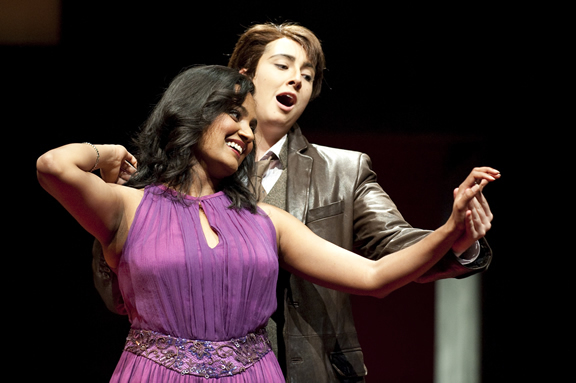 For the opera to be successful, the singing must be compelling when the plot isn't. The program notes state that “We have retained all the arias but two...so as to show off our singers.” This performance was, if anything, about singing. There was no fear by any of the performers in tackling some ticklishly difficult arias. Countertenor Anthony Roth Costanzo as Polinesso, in a role often played by a mezzo, successfully negotiated the Act 3 aria Dover, giustizia, amor, which is challenging even for the best mezzo. Kudos, too, to Cecelia Hall in managing to make the roulades in the Act I aria Con l'ali di costanza seem easy. Period performance devotees, myself included, might question the leisurely tempi of some of the arias, but not the piercingly beautiful centerpiece aria, Ariodante's Scherza infida in grembo al drudo. It could have gone on forever. The conductor and, notably, the bassoonist, handled the accompaniment with great sensitivity. In general the orchestral playing was excellent. Realizing that this performance was meant to be a showcase for the singers, the conductor tried to make sure that the orchestra never overwhelmed the singers, and they rarely did . Other members of the cast were also outstanding. Haeren Hong as Dalinda was expressive in both singing and acting, able to swing naturally from the alluring to the repentant. Shenyang as the king performed with convincing gravitas. Nicholas Coppolo made Lurcanio, next to Odoardo the least interesting character, in the opera, believable. Special praise should go to his performance of the difficult Act 2 aria Il tuo sangue, ed il tuo zelo. I do, though, have to question some of the staging decisions. For most of the opera, characters who should have been offstage were onstage. Sometimes this worked, as in the ending of Act 2 where the cast posed supinely, as if on a canvas, in despair. At other times it seemed inconsistent, one character seemingly invisible, the next one part of the action. In Act 2, the King sits at a desk, stage left, with his back to the audience, not part of the action, turning his head to the characters (at least once) for no purpose that I can see. The lighting, as well, could have been synchronized a bit more; it became at times brighter or darker for no apparent reason. Minor caveats, though, for a wonderful production. If you're in the NY area, there are two more performances: Friday, November 13th at 8 PM, with a Sunday matinee on November 15th at 2 PM. Go see it. One final question asked of me by my opera buddy. If one feels compelled to shout something out after each aria, does one yell “Bravo” or “Brava” to a performer in a trouser role? My answer would be “Bravi,” but only at the end of the performance. Photos: Courtesy of Nan Melville.